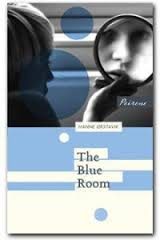 Hanne Orstavik’s The Blue Room remains one of my favourite Peirene Press titles, an unsettling exploration of a mother-daughter relationship. 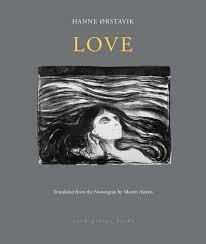 Four years on another of Orstavik’s short novels, Love, has belatedly appeared in English (this time translated by Martin Aitken). It, too, focuses on a mother and child, though, if The Blue Room suggested an over-bearing, over-protective mother, Love presents us with something quite different. As Jon leaves to sell raffle tickets for the sports club he has joined (the two of them are recent arrivals in the village, with a back story only vaguely hinted at), Vibeke is, again, elsewhere (“To go with a dark, brown-eyed man, she thinks with a little smile.”) She bathes herself in preparation for a night out while Jon endures a number of strange encounters beginning with an old man inviting him into his basement. These encounters, with various strangers, seem designed to suggest a series of possible dangers to an adult perspective, while at the same time conveying the essential strangeness of childhood where so many experiences are new. (Take, for example, the teenage girl who invites him in to listen to music and then fall asleep). The narratives are now so divergent that it is possible to wonder if Jon exists. Could Vibeke really have forgotten about his birthday, or, indeed, about him? It is likely that sympathy for Vibeke will vary from reader to reader. Her loneliness is evident, though the vagueness of her backstory suggests Orstavik wishes her to be judge on the actions of one night. The ending is particularly ominous: although Jon has escaped the potential hazards of strangers, he remains outside on a night which Orstavik has repeatedly emphasised as cold. Just like The Blue Room, Love is a disturbing novel which forces us to re-evaluate the assumption of a natural bond between mother and child, and therefore our idea of love. Orstavik is a writer who fearlessly transcribes the terrifying in the everyday. Peirene’s second novel in this year’s coming of age series was The Blue Room by Hanne Orstavik translated by Deborah Dawkin. It would be fair to say that The Blue Room has made a powerful impression among those who have read it, as many online reviews will testify. The story it tells at first seems simple enough: the narrator, Johanne, a young woman who lives with her apparently over-protective mother awakes on the day she has chosen to go to America with her new (and perhaps only) boyfriend, Ivar, to find herself locked in her room. In the course of the novella she recounts the development of her relationship with Ivar, but indications that her version of events may not be entirely trustworthy soon begin to appear. What she sees becomes more sexually explicit but with details provided to repulse rather than titivate. It provokes in the reader (or this reader at least) what would be in cartoon terms a double-take, a re-reading to check you haven’t accidentally fallen into another narrative – for narrative, rather than image, it is, with Johanne’s desire to “imagine what it’s like to be there” entirely unexplained. The setting might be the similar: both naked, in a room with a bed and a window, the girl chained, Johanne locked in, but the connection is mysterious. No father is mentioned and Johanne’s brother is, we are told, in America. Of her mother she says at one point, “She’s been through so much.” Yet if the mother is the controlling partner of the relationship, we might wonder why she says to Johanne, “I just can’t stand any more manipulation.” Though, of course, this could be manipulative. How can a writer this good not be known to an English-speaking audience? You are currently browsing the archives for the Hanne Orstavik category.